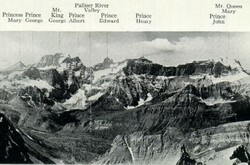 In Volume I of the Interprovincial Boundary Survey, Arthur Wheeler described the Royal Group as, "a very remarkable group of mountains comprising seven distinct peaks, the highest having a altitude of 11,226 fee; it is much in evidence, and its towers and precipitous walls, its glaciers and outlying ridges dominate the landscape from all dirctions. 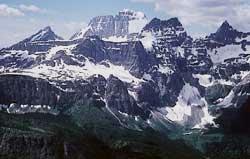 It was first noticed by the Topographical division from Wonder Peak, close to Mount Assiniboine, and the name of "Mt. King George" was then given to the highest summit. The Commissioners now suggest that the title of 'The Royal Group' be applied to this collection of peaks and that the names of the Royal Family be placed upon its several summits. . ."
The names for these peaks chosen by the Interprovincial Boundary Survey were those of the British King and Queen of the day as well as their six children: King George, Queen Mary, Prince Edward, Prince George, Prince Henry, Prince John, Prince Albert, and Princess Mary.